After being cut by the Tennessee Titans 10 days ago, the Tampa Bay Buccaneers are expected to sign quarterback Blaine Gabbert, according to a report Monday. According to The Athletic, Gabbert's experience with new Tampa Bay head coach Bruce Arians while both were with the Arizona Cardinals in the 2017 season is a key factor in the mutual decision. Gabbert, 29, was the Titans backup quarterback to Marcus Mariota last season and played eight games for the oft-injured starter, going 2-1 in three starts. For the season Gabbert completed 60.4 percent of his passes for 626 yards, four touchdown passes and four interceptions. The Titans moved on from Gabbert as a backup when they traded for former Miami Dolphins quarterback Ryan Tannehill on March 15, releasing Gabbert the same day. His final start last season came in a winner-take-all season finale against the Titans' AFC South rivals, the Indianapolis Colts. Tennessee lost 33-17 to miss the postseason. In that game Gabbert went 18-for-29 for 165 yards, one touchdown and two interceptions. 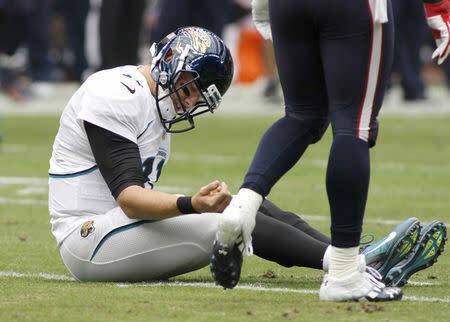 Originally selected 10th overall in the 2011 NFL Draft by the Jacksonville Jaguars, Gabbert has played for four teams in his eight seasons -- the Jaguars (2011-13), the San Francisco 49ers (2014-16), plus the Cardinals (2017) and Titans last season. Gabbert owns a career 13-35 record as an NFL starter, working mostly as a backup since 2013. For his career he has played in 56 games (48 starts), throwing for 9,063 yards with 48 TDs, 47 interceptions and a 71.7 passer rating.